Price: $9.99 $29.99 66.69% off i The regular prices might have a slight change due to amazon seller's control. 99.9% CLEAN RATE - 360° rotatable nozzle(2 pieces included) can spray a fine jet of 0.6mm with a frequency of 1400 pulses per minute, along with a 40-90 PSI water pressure, which help you clean 99.9% of tooth deformities, food debris, tooth stains, tartar deep in the gingival sulcus and interdental space, and plaque on the braces. Also prevent tooth changes, calculus, bleeding gums, swelling and pain. Its clean rate is 3 times that of the ordinary flosser. SUITABLE FOR THE WHOLE FAMILY - For healthier gums, the cordless water flosser can be set to two different speeds - a high speed pulse for daily cleaning and a gentler low speed pulse for your children and elders with sensitive gums. You can choose these two modes according to your needs. Gentle mode is recommended for the first time. ULTRA-LONG STANDBY TIME - SUNAVO’s portable cordless water flosser has two 1500mAh built-in rechargeable NI-MH batteries providing a higher efficiency. It runs for 20-25 days on a full charge of 8 hours (2 minutes per use per day). It will turn off automatically after 2 minutes of a single use, then restart by pressing on-off button if needed. 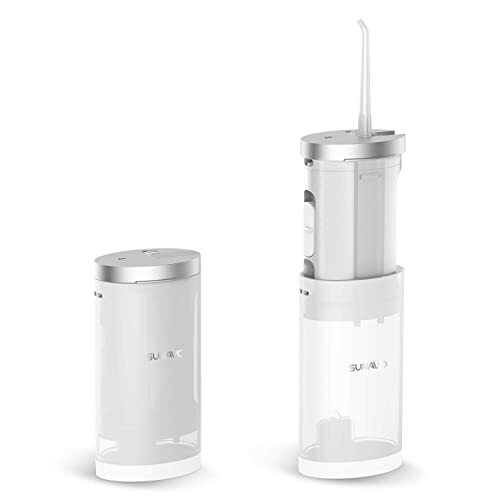 DOUBLE WATERPROOF DESIGN- This oral irrigator adopts IPX7 waterproof design for the interior and exterior. It is convenient to use in the bathroom. Cleaning and maintenance is simple. All parts are 100% waterproof, and each can be washed and rinsed thoroughly under the faucet, and the 180ml water tank can be easily filled with water. QUALITY CERTIFIED, SAFETY GUARANTEED -The included carry pouch makes this cordless water flosser portable to take for travelling, or can be used for office, hotel, or home. It has passed UL, FCC, CE, and FDA quality certifications. It is BPA free and covered with a 2-year warranty. Please rest assured to use it. small unit but working well pros- pressurised water flow for good cleaning, charging also quick, long battery life. Cons- difficult to practice for beginners more clear instructions with photo or video maybe needed for beginners. Hey,come to try WF-01 Cordless Water Flosser 2 Modes, IPX7 Waterproof Oral Irrigator Rechargeable Braces and Teeth Whitening,Dental Water Jet Portable Collapsible Travel and Home now.It's a trial rebates.